Sorry, we are currently sold out of 'Baratza Preciso Coffee Mill'. Please check back later. The Baratza Preciso builds upon the heavy duty Virtuoso by adding micro grinding controls, making more than 400 grind steps available. The Preciso adds extra precision and control to the great basic features of the Virtuoso. It retains the 40 grind adjustment steps of the Virtuoso, but a second micro adjustment lever further divides each of the 40 steps into 11 distinct settings. This makes it possible to fine tune your grind, which is especially important to espresso, where the rate and flow can alter crema and body. 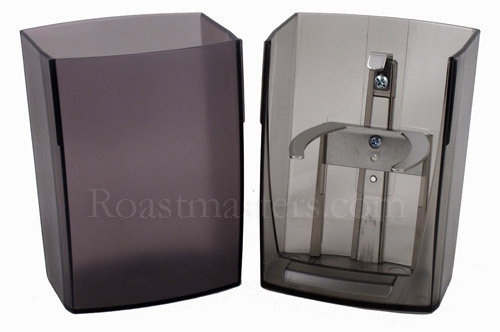 The Preciso ships with both the standard 5 ounce grounds bin as well as Baratza's innovative PortaHolder. The PortaHolder makes grinding for espresso a little easier and helps make clean up a snap. 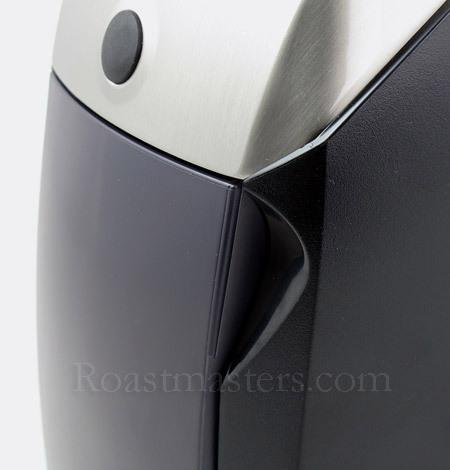 Like the Virtuoso, the body upon which this grinder is refined, it is really substantial, solid in every respect. This item includes free FedEx ground shipping in the Continental US. Though a new product, the Preciso has already undergone significant improvements in its design. Most notably the Preciso features an entirely new Conical burr set that is precise and fast; the burrs provide extreme uniformity of grind and throughput that is 2.4 times faster than Baratza's other conical burr mills. New conical burr set: The new 40 mm conical burrs used in the Preciso grind coffee at over 2.5 times as fast as the Virtuoso (1.8 g/sec to 2.5 g/sec. depending on the particle size.) Also, the particle distribution (especially for drip and press) is very unimodal, meaning there are very few fines in the coffee. This results in a cleaner, brighter, no-silt cup of coffee. 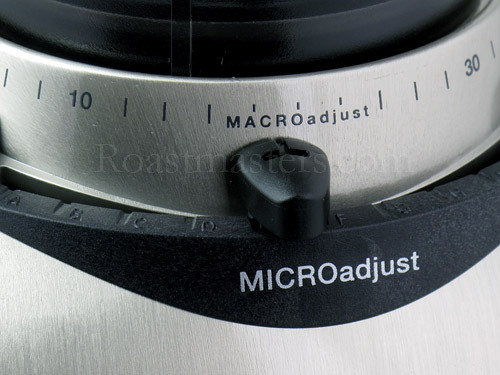 New Micro Adjust Allows You To Dial In The Perfect Espresso Grind: A secondary micro adjust lever further divides each of the 40 Macro positions into 11 distinct steps. These steps(10 microns each), enable you to precisely turn the grind for the perfect shot. Pulse Button and 60 Second Timers: Front mounted pulse button makes it easy to grind directly into an espresso filter basket. 60 second adjustable timer with segmented graphics can be set for easily repeatable grind times. Calibration System: An innovative burr calibration sytem ensures that each grinder has the full range of grind; fine enough for any espresso machine and coarse enough for French Press. DC Motor: A powerful DC motor turns slowly at 450 rpm (adjustable /- 10%) resulting in cool, quiet operation and permits extended grinding time. The circuitry is equipped with an automatically resetting thermal cut-off switch. Cast metal upper housing and base for beauty and stability. High efficiency motor is powerful and spins slowly resulting in cool, quiet operation. Timer switch for repeatable grinding time. 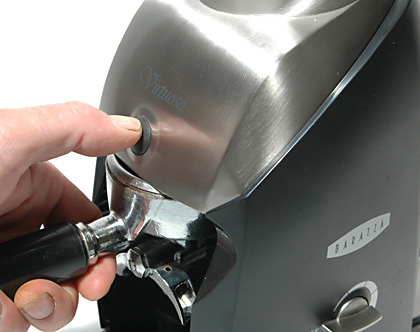 Front-mounted pulse button makes it easy to grind directly into an espresso brew basket. 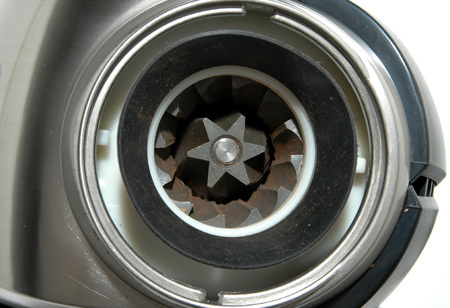 New concise design of grinding chamber reduces coffee dust, making the removable burrs easy to clean. Large 5 oz. grounds bin. Grind calibration provides 400 steps from espresso to coarse. The Preciso has extreme fine tuning for espresso. Particle distribution, especially for drip and press, is very unimodal meaning there are very few fines in the coffee. This results in a cleaner, brighter, no-silt cup of coffee. Looking down into burr housing. Burrs are 40 mm commercial grade conical burrs. Side view new notched grounds bin for easy removal. The Preciso ships with standard grounds bin and PortaHolder for espresso. Dimensions WxHxD 5W" x 14"H x 6D"
Packaged using 100% recyclable materials.